Unable to sleep it seems like a good time to catch up. I have intended to share numerous items the past few months only to let them fall by the wayside as time moved on. Just a few minutes drive from my home is an unincorporated community called Fearrington Village. A mixed use development built on old farmland it has restaurants, shops, a fabulous independent bookstore, and it has lovely gardens, which are the legacy of the developer’s late wife Jenny Fitch. Several weeks ago I met friends there for lunch at The Granary (one of many repurposed farm buildings). 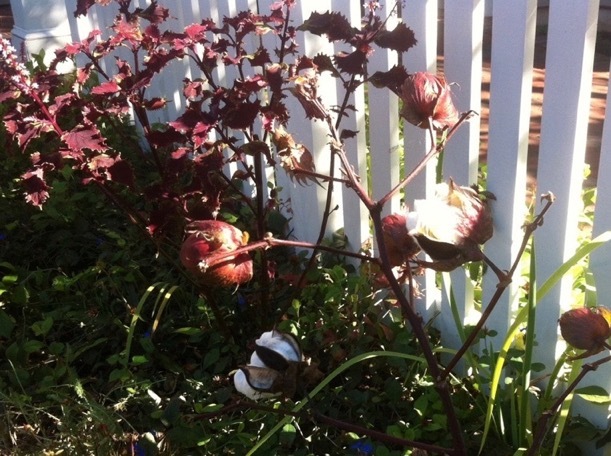 Afterwards during a stroll around the shops and grounds we came upon cotton growing in one of the borders, its unopened bolls and stem color echoing the reddish hues of its coleus companions. A few days later I was back at Fearrington, this time to attend a talk sponsored by the community’s garden club. I am a member of a different club, but fortunately heard about this event—exciting because the guest speaker was Marian St. Clair. I have been a long-time reader of Marian at her blog Hortitopia, so it was delightful to get to meet her. She was even more friendly, smart and funny in person and she gave an informative and entertaining presentation on Growing Good Gardens…Finding Ideas & Inspiration in All the Right Places. 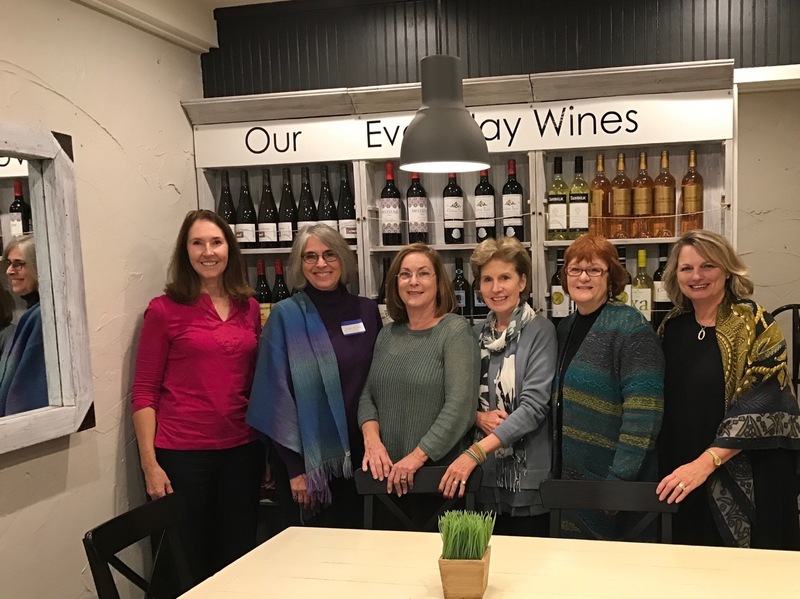 After her talk several of us had a chance to chat over a glass of wine at Fearrington’s coffee and wine shop, The Goat. Except along the north side of the house, my garden does not have perfect growing conditions for growing camellias. Brie assured me the two tea plants can grow in full sun, but I will have to think carefully about where to site the japonicas. I have picked up various spring bulbs that need planting too. Rainy today—time to ponder. 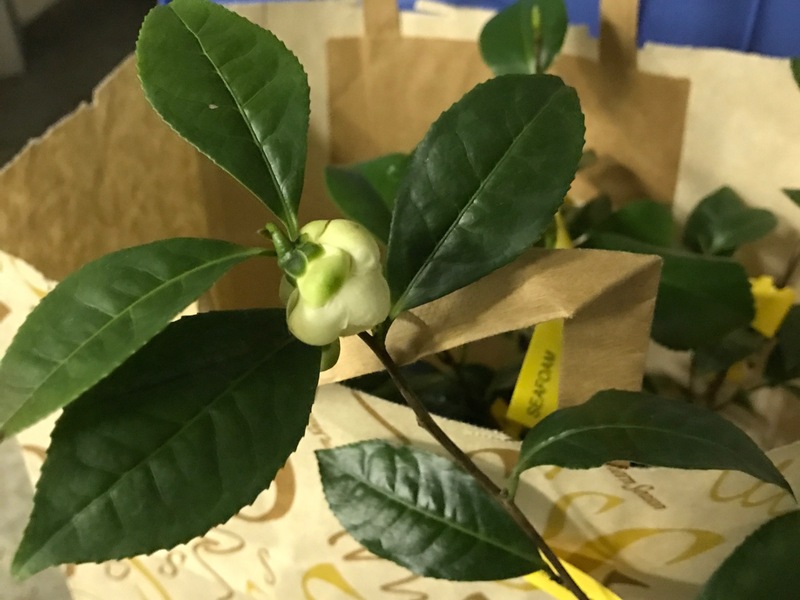 This entry was posted in garden and tagged Camellia japonica 'Seafoam', Camellia sinensis 'Pulaski Tea' on November 30, 2016 by pbmgarden. Good luck with your camellia. I have replaced my roses with camellias, as my garden has gotten more shade. I love cotton and used to grow it in my garden. I need to look for the red, as it looks more decorative. Thanks, hope I can keep the camellias happy. Love the cotton! and the creativity behind using it in the garden. Glad to hear you are getting some rain, hopefully quenching some of the wildfires! Ponder away. The wildfire that was threatening my cousin’s property has been 100% contained and she is getting rain too. Still other places are dealing with fire though. I hope you aren’t worrying about something that is making you unable to sleep Susie. I love the red cotton; I don’t think I’ve never seen it growing, at the stage you showed it, it is most attractive. I’m glad you’re able to attend interesting talks; that is something I very much miss here. I do enjoy garden-related talks. There are frequently good ones but I can’t make it to all. Maybe I’ll try cotton next year too. Susie: Glad you posted the full picture of all of us! I hadn’t been sure whether to do that. So glad you enjoyed the talk, Marian, and coming here. Yes, I’ve seen the cotton over there; and my neighbor grows some too! I love walking by it each morning as it is just so unique! I bought one camellia yesterday so must get it in the ground…I planted about 150 tulips on Sunday so cannot wait for spring! I grew up seeing cotton fields so have taken it for granted. Nice to see it grow in this particular setting, a nod to the history of the place (although don’t know if cotton was grown on this land historically). Oh, see there–you are full of important information. Thanks for mentioning weevil traps as I certainly would never have thought of that. Maybe I’ll try okra instead. We all enjoyed seeing you Marian! Yes, it was fun to meet Marian. I’ve met one other local blogger, Libby, pictured above and Christina last year. Wonderful to connect with them and looking forward to the Fling this summer. Fingers crossed the camellias will survive and flower. Definitely should be taking advantage of a balmy day to plant, but expecting company shortly so headed off the the airport. 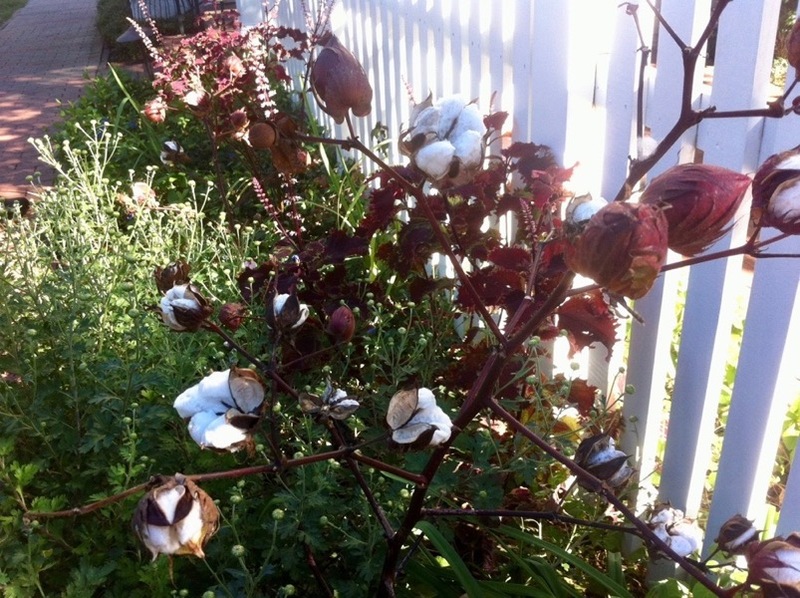 Who knew that cotton was such a pretty graden-worthy plant?! I know, pretty cool used this way, but I’ll take heed after Marian’s warning about boll weevils. Sounds like you had a pleasant, rewarding November! I met Marian at one of the Flings and she was delightful. It’s wonderful to meet folks in person after getting to know them through their blogs. Beautiful plants and lovely photos. Happy holidays! Thanks Beth. Looking forward to my first fling. Happy holidays to you. I have met Marian, she is a delightful person. Your cotton plant reminds me of a summer I worked on a cotton farm. (Really.) The plants were very tall and in flower at the time I was there. As I remember them they looked like white and pink roses. She mentioned you and Judy had a great time at dinner one evening. You worked on a cotton farm? Fascinating. 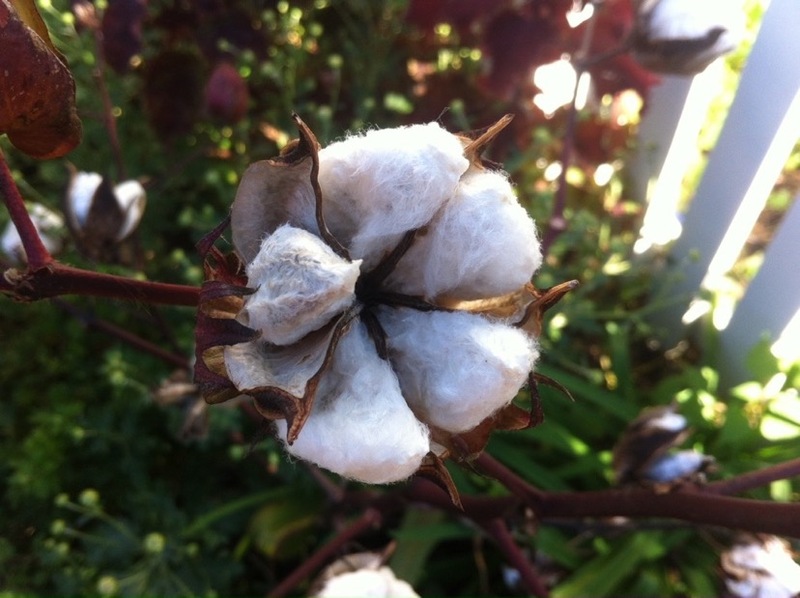 Cotton was grown all around the small town where I grew up but I never had much or anything actually to do with it. So it was actually a kibbutz where I stayed for about three months. They grew cotton, apples, and avocados. Also lots of chickens. One of the jobs I had was riding on the back of a tractor and spritzing weeds growing in the cotton with herbicide. At Christmas time here they often sell funny little sealed kits containing unusal plant seeds as stocking fillers. I remember subsequently trying to grow cotton in the greenhouse for my son, but I don’t think it came to much. So it is lovely to see the red cotton plant in your post. Marian is such a mine of information! I imagine growing the cotton for your son was a fun experience. Seeds are difficult for me but they fill the imagination with possibilities. I agree Marian is interesting and well-informed.